Different OSP’s are used by different PWB fabrication manufactures with different performance properties. OSP is sensitive to exposure to chemical cleaning. 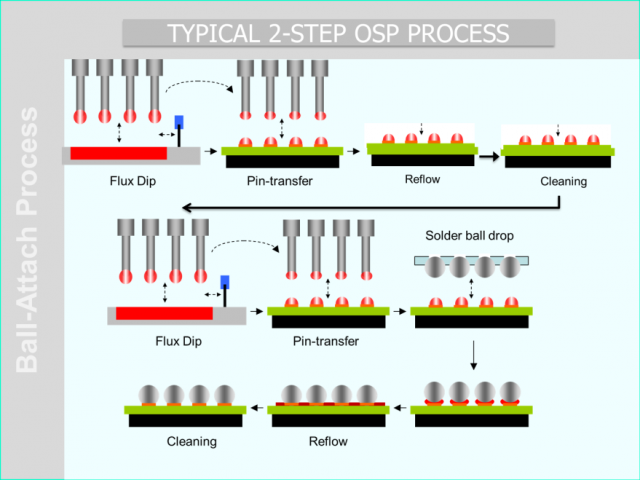 But, the problem with removing the 1st soldering step to create a “one-step” soldering process is that defects can occur, including: poor wetting on the preconditioned OSP surface which would give variability in both joint strength and bump coplanarity, and the “missing-ball”/”big-ball” effects.